Porsche won the 24 Hours of Le Mans last year finishing in first and second place with its 919 Hybrid. 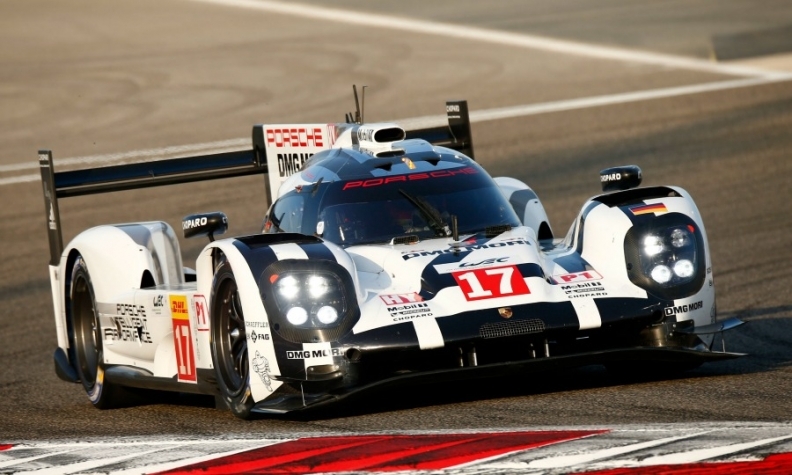 It was Porsche's record 17th victory in the endurance race and first win since 1998. Europe’s top motorsports series now have a mixture of powertrains as varied as those available at local dealerships. Formula One’s gasoline-sucking V-8s have been replaced by turbocharged V-6s equipped with sophisticated hybrid systems. The reigning Le Mans champion has a hybrid drivetrain rather than the V-12s used in the past. Meanwhile battery performance is key to determining the champion in the 2-year-old Formula E series. The big changes have helped automakers such as Mercedes-Benz, Porsche and Renault test and build awareness of their alternative drivetrains and new technologies ahead of launching them on production cars. This technology transfer is crucially important not only to justify the huge sums spent to compete – from about 50 million to 75 million euros for a Formula E season to more than 400 million euros for F1 – but also to accelerate the use of CO2-saving electrification solutions on production cars. Those technologies are expected to play a crucial role in helping automakers meet tougher emissions rules that will come into force in Europe in 2020. And while it is impossible to definitively measure the effect that racing is having on the uptake of hybrids and electric cars in Europe, the link to motorsports definitely has not hurt. 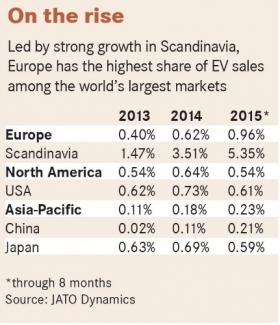 Sales are rising in both of the automotive niches, and EVs now hold a near 1 percent market share in Europe, which is by far the strongest penetration for battery-powered vehicles in the world (see chart below). The ability to transfer technology from motorsports to production cars increased significantly in 2014 with the hybridization of engines used in F1. It is a change that top automotive bosses have welcomed. “We are very pleased to have objectives and targets in F1 that are much more similar to the objectives for our production cars,” said Daimler CEO Dieter Zetsche, whose Mercedes brand has won the last two F1 championships. In his view, being challenged by F1 rules to deliver top performance with fewer cylinders, turbocharging and hybrid systems mirrors what Mercedes strives to do with its production cars. To emphasize this fact, Mercedes in 2014 ran an ad campaign for its S 500 plug-in hybrid featuring F1 drivers Lewis Hamilton and Nico Rosberg. In addition, press reports last year suggested that the automaker was working on a supercar for its AMG subbrand that will offer up to 1000 hp and borrow technologies from its F1 racecar. Experts see a similar crossover benefit from the World Endurance Championship (WEC), for which the 24 Hours of Le Mans is the sport’s signature event. “The research required to achieve higher efficiency in F1 and the WEC has aligned the main objectives of these top motorsports series with those that each automaker faces every day,” said Riccardo Cesarini, who heads the performance group at Italy supplier Brembo, which is a leading provider of braking systems to racecars. “Ford going back to Le Mans to take on the premium brands in GT racing feels right as a platform to promote technology,” Ford of Europe CEO Jim Farley told Automotive News Europe. CEOs such as PSA/Peugeot-Citroen’s Carlos Tavares also recognize another key benefit from racing. “Motorsports is a marketing tool,” Tavares told Automotive News Europe, adding that his Peugeot, Citroen and DS Automobiles brands are under no pressure to join a series just because “their CEO is a motorsports addict.” If a brand boss sees a chance to make a better margin using the marketing budget elsewhere, that is fine with the CEO. He does, however, like to point out that it is impossible to be regarded as a great automotive brand without having had success on the racetrack at some point in the company’s history. “Persistent participation in motorsports is also a tool to create brand value on a long-term basis,” Tavares said. 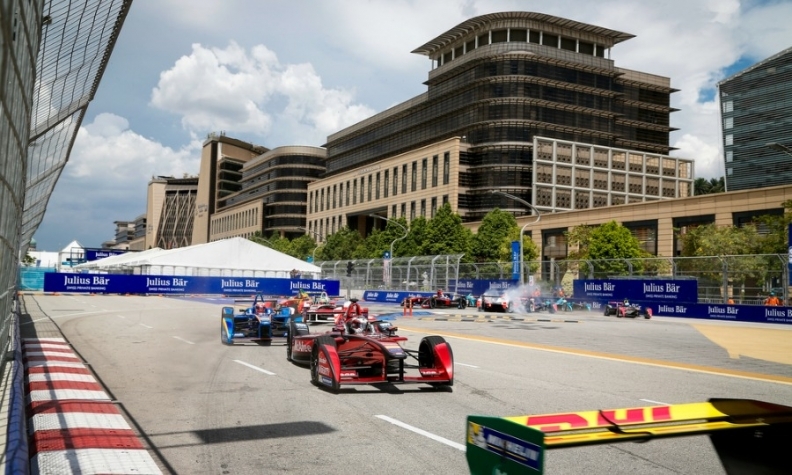 Formula E has battery-powered racecars from companies such as Audi, Renault, DS Automobiles and Mahindra & Mahindra. The zero-emissions series takes place in cities such as London, Berlin, Beijing, Buenos Aires and Moscow. Formula E is in its infancy while F1, its much better-known rival, is battling against decline. The annual TV audience for the series dipped to 425 million viewers last year from about 450 million viewers in 2014, according to ratings provided by race organizers. Despite the slide F1 still touts itself as the world’s second-most watched sport after soccer. In addition, it is still considered the most demanding proving ground for any automotive technology. Cornering speeds are so intense that drivers can briefly weigh close to 500kg as their bodies withstand forces equivalent to five times gravity. Technically, the cars could be equipped with even more power, but driving at higher speeds could cause drivers to black out in the curves. While prestigious, competing in F1 is very costly and a failure to win -- or at least compete -- can dent an automaker’s image off the track. Another knock against F1 is that it is no longer as European as it once was. Last year Germany for the first time in 60 years did not host a Grand Prix race. This year’s race at the legendary Monza circuit, one of F1’s temples, could be the last unless Italian organizers secure the 20 million euros reportedly needed to host an F1 event. Races in Germany and Italy are being replaced by tracks in emerging markets where organizers are looking to raise their profile. The clearest example is this year’s European Grand Prix, which will be held in Baku, the capital of oil-rich Azerbaijan. Not all automakers are believers. Jaguar Land Rover CEO Ralf Speth told Automotive News Europe that he does not see F1 and other fuel-powered series having a future because they are not environmentally friendly enough. JLR, therefore, will join Formula E for its third season, which starts in the autumn. It is a big move for a company that trails premium rivals in offering alternative powertrains. Despite F1’s struggle to maintain its audience and the teething problems of Formula E, the old adage “Win on Sunday, sell on Monday” remains relevant in Europe in the 21st century. Perhaps more than ever, success on the track translates into better, greener products to sell, which can boost profits and improve a brand’s image.